Newcomers leave their mark on the Mahindra Indo-American Arts Council Film Festival, reports Arthur J Pais. Two young cousins who meet at a family wedding play hide-and-seek, but the real search begins when one of the boys dies and the other one hopes to "find" his cousin again. Umesh Kulkarni's Marathi language film Vihir (The Well), which depicts the unusual search, was voted as the best feature film at the 10th Mahindra Indo-American Arts Council Film Festival in New York City. Veteran actor Mohan Aghashe, who stars in Vihir, accepted the award from Salman Rushide, a friend of the festival since its inception, on behalf of Kulkarni. Vihir won against films like The Japanese Wife from veteran film-maker Aparna Sen. The winners chosen by a jury of 14, including film scholar Parag R Amaladi and actress Poorna Jagannathan, picked from 19 feature films and documentaries screened over five days, ending November 14. Apart from India, the films came from Canada (Cooking with Stella), Australia (The Waiting City) and Israel (Rafting to Bombay). Featuring an ensemble cast led by Tusshar Kapoor, Shor tells three stories set in Mumbai: An expatriate Indian has to fight hard to find welcome in what he thinks as an unfriendly city; a bootlegger has to do some serious thinking about his life when he and his associates find a bag of explosives in an unexpected place and a young cricketer has to make a serious decision about his career. While Ajay Naidu received the best actor nod for Ashes, a gripping film about two siblings whose lives take very different turns, Seema Biswas took a trophy for her comical performance as a devious domestic help in Dilip Mehta's Cooking With Stella. 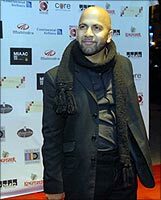 Naidu, who also co-wrote, co-produced, directed Ashes, which has been brewing for nearly a decade, was the most overwhelmed award recipient. He said he had even wondered if he would be able to complete the film and make it to the festival. He received, apart from Biswas, the loudest applause in the evening. Ganesh, Boy Wonder, the first documentary from TV and movie (Masala) director Srinivas Krishna, bagged the best award in the category. It focuses on a young boy whose facial deformity has given him a Ganesh-like look, and how the lives of the parents who brought up the boy against many odds began to change when doctors offered to operate on the boy. "I thought I would shoot the film in just about two-and-a-half weeks,' said the Toronto-based director. "It took nearly two years." The best screenplay award went to Memories in March, a poignant story of a mother who comes to the city to collect the belongings of her son killed in an accident. In the process, she discovers a son she hardly knew. Filmmaker Rituparno Ghosh, also an occasional actor (as in this film), wrote the script. The award was presented by writer Suketu Mehta. MIAAC presented a life-time achievement award to composer A R Rahman, who could not make it. Filmmaker Mani Ratnam, who was at the festival for the special screening of Ravanan, accepted the award on the music composer's behalf.